how to be a happy person today. 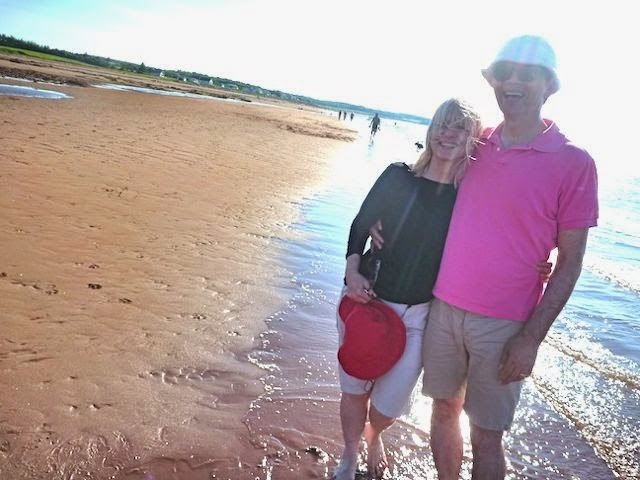 Me and Steven on the beach we love in Nova Scotia. sure when we're going, but can't wait! 10 Reasons art makes you happy! is are always making something new. What a treat! passion -- you live a blessed life. created isn't art. And that is true of every age. displayed fantastic art in New York. Art is for life. colour and light as you do. 6. You make people happy with your work. in their lives, or the people who people love. with joy -- awesome feeling. you -- wondering what you will try next. the opening! So much fun! do and getting paid for it! Barbara, I recognized Louise Hay immediately! Fantastic portrait of her! I loved all your reasons for being grateful for being an artist and resonate with them all! I too got a lot out of Louise' book when I read it a couple of decades ago. A handsome couple index and a beautiful Canadian beach and last but not least, a very cool acrylic portrait! Hey there , , , I'm so lonely. Can you try leaving a comment on my blog again? Happy Canada Day! HaPpY post, Barbara, and wonderful wee painting - WOW!! thanks for the wonderful reminders about what is so great about being an artist. YOu are right, it is fun! super portrait! 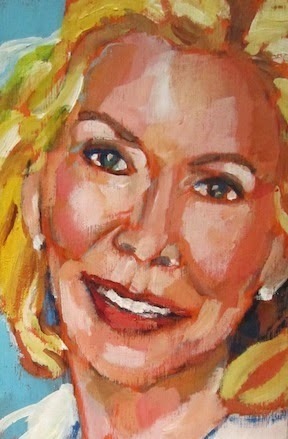 I dont know Louise Hay, But I love the way you painted her. I'm so glad you recognized her. She is still doing amazing work, and is one of my heroes. My brother suggested that Louise Hay, Deepak Chopra and Mike Dooley are like our modern day saints. I don't know that Louise would like that, but this little painting on wood is a lot like an icon. Love your drawings and photographs. What happy news that my comment came through. Thanks for yours. I was feeling lonely too. Glad you like the portrait. You are one of my true heroes in the portrait (and landscape, and cityscape and still life) realm. Your fan (and you need fans here these days -- very hot) in the T.dot. Thanks so much. I'm glad you like my wee portrait. I notice you are going very big, and I love them. Louise Hay has some pretty wonderful meditations on YouTube. I think you'd enjoy them. You don't have to watch, just listen She really knows how to make you feel relaxed, happy, wonderful. She is a buoyant spirit like you. I love your work! So gorgeous.